"Barber Dimes. With an image of Liberty emblazoned on the obverse, this 19th and early 20th century work-horse series represents a pinnacle of classical American coinage. Minted from 1892 to 1916, the Barber Dime saw extensive circulation and regular use in commercial channels during an era of rapid economic expansion. 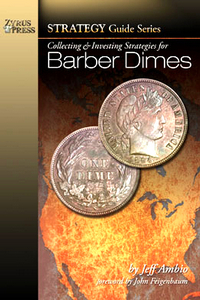 Collecting and Investing Strategies for Barber Dimes is devoted to a detailed analysis of every proof and business strike issue in the Barber Dime series. Jeff Ambio, a preeminent numismatic researcher and prolific cataloguer for America s top auction companies, offers insights on several methods through which to build a collection, key factors governing the market in which these coins trade, and invaluable strategies for collecting and investing in Barber Dimes. Included within this guide is current information on pricing, auction records, strike, luster, population and rarity rankings. Ambio s personal insights, keen observations, and important contribution to the body of information available on this series not only offers collectors a unique opportunity to learn more about Barber Dimes, but will serve for generations to come as the standard reference on the series."